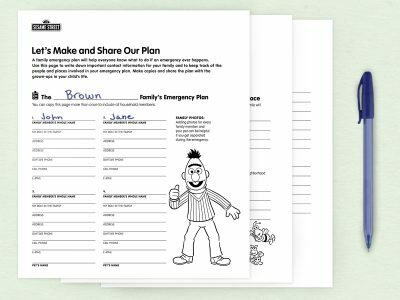 The Big Idea: An emergency plan includes information to help family members and care providers handle an emergency. Together with kids, fill out these pages. You can print them or save and email them to the important people in kids’ lives. Display where kids can see it. From time to time, ask kids about the important people and places in your plan. Who could kids call (or ask a grown-up to call) if they can’t reach a parent? Where should they meet in an emergency? Who is their out-of-town emergency contact?